President Donald J Trump has (cleverly) popularised the term 'Fake News'...inviting suspicion over what's being reported. Are we being subjected to the 'mushroom treatment'? Of course we are...and it's not just from our politicians. Employment figures - based on the loosest definition of employment - bear no resemblance to what's really happening in worker land. However, a gullible public accept this nonsense with no questions asked. When it comes to fake news, it doesn't come much 'faker' than the GDP numbers. This data, long ago, ceased to be an indicator of our nation's productive capacity. Each quarter we're told a positive number is a sign of our strengthening economy. The GDP number is a proxy for debt accumulation. The higher the GDP number, the deeper our nation went into debt. A good GDP number is actually bad news. Then we have our trusted institutions. The Banking Royal Commission shed light on what happens behind those boardroom doors. An altered expert report. Blind eyes turned towards fee gouging. Shoddy lending practices. Yet, the public face presented by these so-called pillars of society was one of respectability and prudence. And what about some of those high-profile US stocks? 'Facebook has outright dismissed a report from a former Harvard classmate of CEO Mark Zuckerberg claiming that more than half of the social network's users are fake. 'The report was published last week by Aaron Greenspan, who studied alongside the billionaire tech executive and claims to have come up with the idea for Facebook first. It's fair to say the former Harvard classmates do not exchange Christmas cards. Really? Who would have thought there would be a financial motive behind publishing fake numbers (he says with tongue firmly planted in cheek)? Aaron Greenspan may have an axe to grind. In the US, there's more accounts than there are people. The discrepancy in the numbers could be due to people having more than one account. As someone who doesn't use Facebook, I have no idea why you'd have one account let alone multiple ones. Anyway, each to their own. The US census data makes me think that Greenspan's fake account claim of 50% is a little overstated, but Facebook's counterclaim of only 2-3% is somewhat understated. Perhaps the truth lies somewhere in between. If the account numbers are (even somewhat) fake, then Facebook is doing the equivalent of our banks...generating revenue for accounts that are dead. Then we have my old favourite boom time stock...Tesla. Is this company worth US$57 billion? Perhaps previous sales justify the price? The folks who run the Tesla Charts site have done some digging of their own. 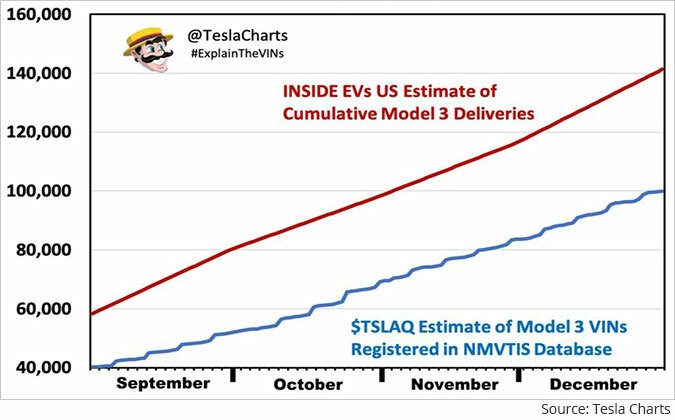 There appears to be a 40,000 difference between the Tesla delivery figures and the NMVTIS data. Hmmm...perhaps they've been garaged, never to be driven on the road. And finally, we come back to what I think will be the epicentre of the next crisis...US corporate debt. In August 2017, [Elon] Musk raised US$1.8 billion from investors to finance the ongoing operation of his loss making enterprise [Tesla]. The bonds were issued with a face value of US$100 paying 5.3% per annum until August 2025. The bonds are currently trading at US$86...a capital loss (so far) of 14%. The interest paid - around 18 months at 5.3% per annum - has only partially offset this loss. People buy into the equity and/or debt positions of these companies based on what's publicly declared...just like those who bought AMP shares before the Royal Commission. Then, when the proverbial hits the fan, and the ugly truth is revealed, their capital is shredded...and that's a well-known fact. The questions over the accuracy in the numbers of Facebook, Tesla and a host of other companies is why I prefer to invest in the index...when it's trading below the 'mean'. At present, the US share market - which sets the tone for the rest of the world - is, by any number of valuation methods, seriously overvalued. If there is one golden rule in finance, it is 'mean reversion'. Everything, in due course, reverts to the 'mean'...otherwise there would not be a 'mean'. Wealth cannot outgrow the economy supporting that wealth. There is a mathematical relationship between wealth and the economy...as demonstrated in the following chart. The nearly 70-year relationship between US Household Net Worth and GDP is 379%. On average, over the long term, US net worth settles in around 3.8 times the value of the US economy. At present, that relationship has been stretched beyond 500%. On the two prior occasions when there's been significant deviation above the long-term average, we see the principle of 'mean reversion' apply. Markets corrected and balance was (temporarily) restored...until the Fed provided additional stimulus. The volatility we witnessed on the US share market in late 2018 was part of the natural 'reversion to the mean' process. There's been a temporary reprieve...but it will resume again. My advice is ignore the current 'fake' news...instead listen to history. 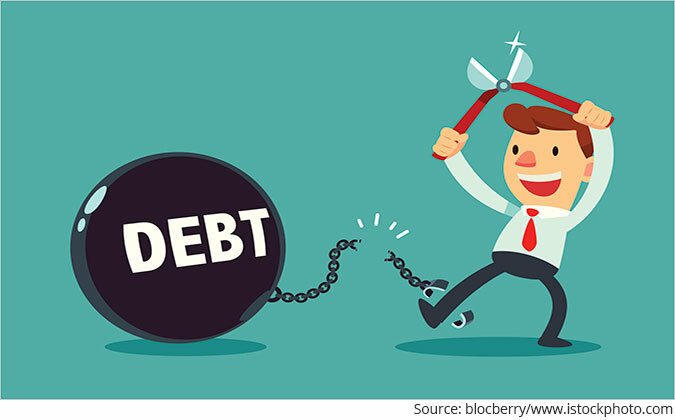 History has repeatedly shown us what happens when there's too much debt in the system. 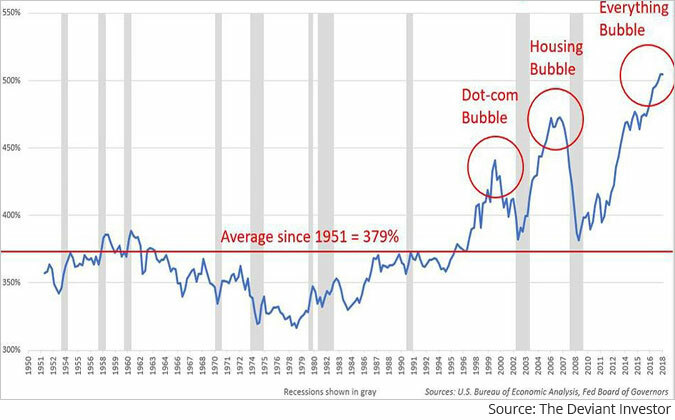 And it's only when this 'Everything Bubble' bursts, that true story will be told...but that will be too late for those who preferred to believe the fiction rather than focus on the facts. Please note: This article was first published in Markets & Money on 4th February 2019. Vern Gowdie is a contributing editor to Money Morning - Australia's biggest circulation daily financial email. Vern has been involved in financial planning since 1986. In 1999, Personal Investor magazine ranked Vern as one of Australia's Top 50 financial planners. His previous firm, Gowdie Financial Planning, was recognized in 2004, 2005, 2006 & 2007, by Independent Financial Adviser (IFA) magazine as one of the top 5 financial planning firms in Australia. Vern has been writing his 'Big Picture' column for regional newspapers since 2005 and has been a commentator on financial matters for Prime Radio talkback. His contrarian views often place him at odds with the financial planning profession. We request your view! Post a comment on "How to Separate Fact from Fiction". Thank you for posting your view!